For that ultimate finishes, super classy concrete floor look, we think yes. It is always a good idea to seal your concrete floor after grinding. At Barefoot Surfaces we are dedicated to making sure all of your Chandler concrete floor coating and sealing needs are met with integrity and professionalism. Whether it is questions about what color to stain your concrete floor or how to proceed after grinding down your concrete floor – we are here to serve Chandler. Grinding your concrete floor will smooth out the surface and bring out the speckled or marbled appearance of the aggregate, which increases the appearance and makes for a more decorative finish. Most often we find that customers and the at-home DIYers feel it is standard practice to seal the grinded concrete to create the glossy look and protect what is beneath. Concrete floor coatings include sealing and polishing. Barefoot can help you grind, seal and coat your concrete to be the perfect concrete floor for your Chandler home or garage. Sealing or polishing will both give you that glossy, finished look that you are hoping for, and there is a couple ways to achieve these results. Not only does sealing after grinding help to protect the surface, but it gives it the finished look that is not attainable with just the porous surface of concrete. Sealing concrete involves spreading a protective liquid coating across the entire surface. Different types of concrete coatings include urethane, Chandler epoxy flooring or acrylic to protect and finish the resurfaced (grinded) concrete. Seals help to create a barrier that protects and lengthens the lifetime of the concrete floor – insuring it against stains from spills, damage from dropping things on it and debris that is walked over on top of the surface. Not only that, but it gives it a glossy or matte finish depending on the type and brand of sealant that you choose, giving you even more options of how you would like your Chandler concrete floor to look. After you have grinded your concrete floor, there is another option. Polishing. Polishing creates a hard but shiny concrete surface that is vulnerable to stains even after the process. In most cases for the added protective layer, the concrete flooring is sealed – directly applied on top of the polished surface for that extra protection. Of course there is always the option of leaving the concrete floor unfinished, but this runs an increased chance of damage and can stain much easier. Concrete sealing is much less labor intensive than having to replace a flooring that was not sealed after being grinded down and lived on (damage, stains, deterioration). Higher abrasion and damage resistance. Cost effective (especially compared to replacing a floor). Once sealed there is very low maintenance to worry about. The completely non-porous surface will be easy to maintain and will not harbor bacteria, dirt, dust or anything else it comes in contact with. Old concrete floor coatings can peel. This means that a layer of coating material more than likely had never adhered fully to the original surface and as it dried and hardened creating pockets of air that eventually rise to the surface, pop and become the perfect place for dust and oil to hide. Dirty concrete floors are able to be grinded but we suggest a thorough cleaning before – to make everyone’s lives easier and the floor looking its absolute best in the end. Before sealing your grinded concrete floor it is best to run some tests to find out if the concrete is at the right stage for this to happen. Once you have grinded the concrete and there is no more debris or dust, usually you will want to power wash it to remove any hidden dirt and get id of the grinding dust. Once the surface is visibly dry, you can use the water test to see if the surface is ready for sealing. Simply drip some clean water to determine how porous the concrete is and how readily the water is absorbed, as this will help indicate if it is ready to be sealed. Barefoot Surfaces has been helping Chandler residents achieve their concrete flooring dreams for over twenty years. 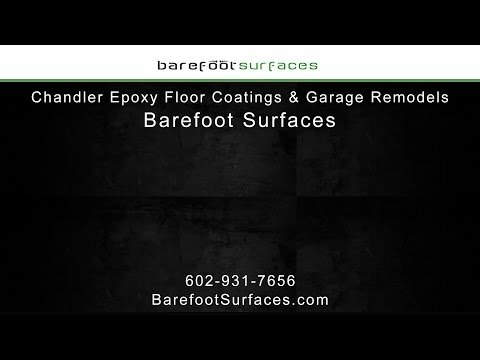 Whether those dreams include Chandler stained concrete, decorative overlays, or even patio epoxy floor coatings in Chandler, Barefoot has the tools and skills to get the job done right. Contact us today.